BitDefender is a very good internet security software company, it offers some very good antivirus, firewall software, and some useful online tools. I like use some online tools that make things are so easy, and you do not need install any software. QuickScan is one of that kind of internet security tool, it combines intelligent local scanning and in-the-cloud scanning to create an advanced online tool which detects e-threats in memory quickly. Why do we have to use QuickScan even we have some antivirus or firewall software? Because it can detect malware, rootkits, keyloggers quickly, some firewall or antivirus software can not detect these spyware, virus. 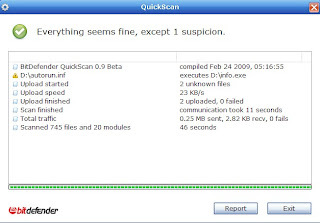 QuickScan is based on BitDefender anti-malware server engine. unfortunately, BitDefender only for IE browser, it does not support Firefox, but you can use a Firefox extension - IE Tab, then turn on "View Page in IE Tab", and going to scan your PC. The procedure is very quick, only about a few minutes. Some files may have to upload to server for more scans. After that, it will give you a result that tells you what files are OK or not. Pretty easy and quick, and it is a free service.